So I was asked to help out in a situation where a Backup Server had begun to run out of space. One of the first things you look at doing is cutting down retention rates. In this particular setup Veeam had its Database and other associated files sitting on a 30GB disk, which also happened to be just about full (30MB free). After a quick run of [ddownload id=”1429″ style=”link” text=”SpaceMonger”] I was able to identify that the Guest Indexing folder was taking up the majority of the space. So I set about making a list of VMs that we didn’t really need indexing for. A thing a lot of people don’t realise is that you don’t need to enable Guest Indexing to perform item level restores but makes the process becomes much faster because Veeam already knows what is in the backup image and where it needs to go. 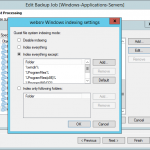 To go about disabling it for particular virtual machines in a backup job, edit the job, go into Guest Processing, hit the indexing button then for each Virtual Machine in your job that you don’t need indexing for, hit edit and then select Disable Indexing. For my job I left it on for an application server that had flat file attachments and file servers, the remainder I turned off for this job. Hope that helps. ProTip: Did you know you can get a 1 year NFR Veeam License if you are certified in some areas of VMWare, Microsoft, Cisco or PernixData?